For those who love music, there is rarely something new and never been done; we have listened to it all and love it or hate it we can rattle off a list of comparative artists like Rainman with numbers. But that is not to say that new music is not creative and it is only a pale shadow of any artist that has come before it. Little Wind is the perfect example of that creative genius that marches on to its very own drummer, hand claps, and glockenspiel. The music and vocal skills will draw the obvious comparisons of Leslie Feist and Joanna Newsom, sans harp. But Smith & Sleeps do a fairly good job of keeping it fresh, emerging into their own sunlight. 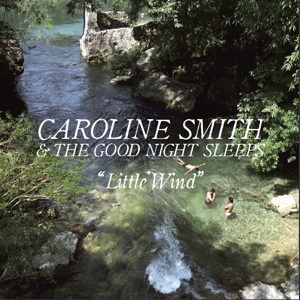 The sophmore effort from Caroline Smith & The Goodnight Sleeps starts off with “Tanktop”, a catchy little pop ditty that starts out like every other pop ditty you’ve ever heard, and then comes into its own, becoming that catchy earworm you almost don’t want to get rid of. “Strong Shoulders” is the new anthem to hum when you need to be reminded why you are doing what you are doing. “Eagles Nest” showcases Caroline’s vocal range as well as the bands’ ability to harmonize beautifully, maintaining their link to their folk roots. “Scholarships” starts off with tinkling glockenspiel and finishes as the most amazing song on the album (in my opinion, of course). This song most illustrates the changes that Tom Herbers (Andrew Bird, Dark Dark Dark, and Low) brought to the band’s process of recording by having him mix the tracks. The band talks frankly about how this album’s sometimes stressful recording process helped them communicate better as a band, “… almost like marriage counseling” Smith wisecracked. They also recorded at the Terraruim, with the goal of achieving a cleaner, more professional sound. Well, they got it and it did not diminish their innocent charm or introspective lyrics. Smith & company are a band of young folks so we shall all look forward to seeing yet more growth, lyrics about life without boys, and the inevitable metal folk opera/experimental album to come. Who knows? New instruments to come could be a harp, bagpipes, or if we’re really lucky maybe even a tambourine. Caroline Smith – Calliope – NORTH SHORE SESSIONS from North Shore Sessions on Vimeo.